We can supply a wide range of gusseted flexiloop carrier bags. The main difference between this carrier and others is the flexible handle. The handle can be of either LDPE or HDPE depending on the quantity you are ordering. The bag shown here as a rigid polythene handle, which is constructed from folind and welding the polythene to make a robust folded tape handle. The handle can be produced from any colour polythene, as can the bag material too. The gusseted flexiloop carrier bag is produced from a standard gauge material, usually between 65mu and 85mu (micron) LDPE (Low Density polythene) or HDPE (High Density polythene). Having a side and base gusset allows the bag to have a much greater capacity than the base gusseted bags. These bags are ideal for bag for life carrier bags and promoting reuseable concepts. Flexiloop carrier bags can be produced using a biodegradeable polythene to help the environement too. Other extras on this style of bag include card reinforcements, full colour printing, foil stamping or even a rope handle instead of the flexiloop (the rope handle needs to be supported by a card reinforcement and metal eyelets). Black ink, all sides, 50% coverage. Our Company arrange the production of exhibition tiger print flexiloop poly bag. 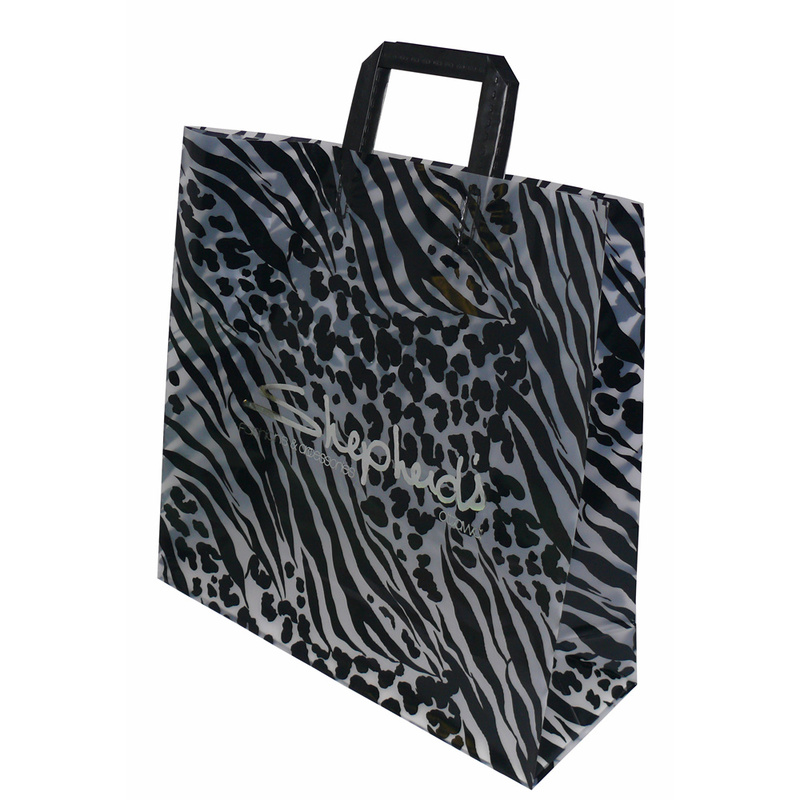 Our design team have the knowledge to help managers purchase bespoke tiger print flexiloop poly bag. To start designing your choose by material or different styles of , please contact our team using our contact page.